Blog » Book Your Smear! Nervous about your Smear Test? Mumbler Sally shares ALL the deets about hers, down to pube admin, Star Wars socks and how honestly, it was nothing to worry about. “I was so excited when the letter arrived- I recognised it immediately and ripped it open at once… “YES! Three years have flown past and I’m just so thrilled that it’s already time for another smear test!” Said no women in the history of woman-kind EVER! Like most women aged 25 to 64 (who are registered with a GP), I received my letter through the post with a “Helping you decide” leaflet which gave a bit more detail. To be honest, I wasn’t much of a fan of the leaflet as to me it read a little bit like- “Oooh, should I decide to buy a nice new pair of shoes or not” rather than “If you decide not to buy this pair of new shoes then you could miss the fact that you could be one of the 3000+ women each year who get cervical cancer…” Okay, I’m taking the metaphor a bit far, but you know what I mean. I’m not generally one to preach, but I make an exception when it comes to smear tests. You shouldn’t be “deciding” if you have one, the only decision to be made is which day of the week you book it in for. Ten years ago in 2009, reality star and mum of two Jade Goody died just 7 months after receiving her diagnosis of cervical cancer. It is estimated that half a million women more than usual attended smear tests due to the “Jade Goody Effect”. However the phenomenon seems to have been forgotten. Smear test numbers are at a 20 year low and we need to do something about it. My letter came just before Christmas and of course, it was shoved at the bottom of my “big pile of important stuff” in the kitchen. It resurfaced two weeks ago and so I had a quick word with myself and actually made the appointment. To be completely honest, the pube admin associated with a smear test is enough to send me under these days! I find myself in a kind of “pre-middle aged no-mans land” as far as pubic hair goes. I’ve discussed this with my gal-pals and they concur (much to my own relief that I’m not the only one who is so shallow!). I had a little chat with one of my besties (who also happens to be a nurse who has done more smears than I’ve had hot dinners) and she assures me that my concerns are basically a waste of brain space. Nurses see the lot. From down-to-your-knees turbo-bushes, to bald as a coot and everything in between, (including vajazzels, piercings, tats and all sorts apparently) Nurses simply don’t care. To them it’s just “another day at the office.” They’ve seen it all and believe me- what ever the state of your lady-garden or your legs/pedi/period pants/ holy socks, they’re just not bothered. 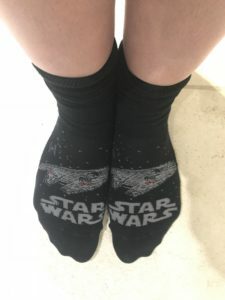 Despite my excellent leg-shaving efforts, I totally forgot about sock choice and am wearing some of my husband’s turbo-geek “Star Wars” socks…. oops. Nurse says that she’ll quickly check the shape of my cervix. Legs bent, ankles towards bum and a quick feel- she’s wearing gloves and uses some lube so it’s really not too bad at all. Just the usual feeling of weirdness that someone that you’re not intimate with, is seeing you in such a state of undress. Apparently satisfied with the shape of my cervix she opens the sterilised speculum. It’s a transparent plastic device- no bigger than a carrot I’d say, which is used to open up the cervix. Again lube is used and whilst it is mildly toe curling, it doesn’t actually hurt. It just feels a bit, well odd and marginally uncomfortable. To take the actual smear test, the nurse gets what looks like a slightly long cotton wool bud and wipes it on your cervix to gather some cells. I could feel this mildly but it didn’t make me flinch. This whole process only took about 2-3 minutes. The nurse then removes the speculum. This doesn’t hurt either but she did warn me that I might have a tiny bit of spotting for a few hours after the test. Knick-nocks and jeans back on and a quick blood pressure test. This struck me as slightly odd as I’m sure that the process of having a smear test will have made my blood pressure rise! Jo’s Cervical Cancer Trust are doing everything that they can to try and get women our age to book their smear, this year they have introduced a “Smear for Smear” campaign to try and raise awareness. 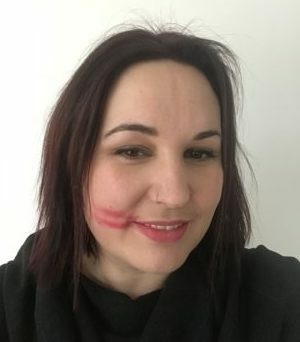 Please get involved, use the #smearforsmear on instagram, book your appointment and remind your mates about booking theirs.